Most of the popular trading analysis softwares are built to run in windows devices and doesnt supports modern devices like Android, IOS devices or event the linux machines or Mac boxes. However the world is migrating fast towards mobiles and tablets, people are shifting to Android and IOS(apple) devices. To solve this we thought of proving cloud based access to the needy people who want to access trading analysis softwares like Amibroker, Metatrader, Ninjatrader, Metastock on the go. It is also possible to access any windows based trading analysis software which is not compatible with Android or IOS based mobile/tablets. Marketcalls is the only hosting solution designed for Indian stock traders. Our platform supports Amibroker & Globaldatafeeds. Currently NimbledataproVM on cloud subscription is available only on Yearly Subscription basis. If you want to host your custom trading analysis software on the cloud do contact our customer support team 09738383344(mon-fri 9.00am – 6.00p.m) to get custom quote. -Access from anywhere on the go. 1)Business men who mostly spends most of their time on travel and business meetings and want to have anywhere access to his favorite trading analysis software. 2)Brokers ,Sub-brokers and Professional Traders who wish to stay connected with the market anywhere in the world where every second of the market movement mean so critical to them. I feel Rajandran filled the gap.. I personally testing this from morning and must say that… I am much impressed to see my lovely Amibroker running from my mobile. We can literally do everything that we do on our PC.. on the go.. on our Mobile. Thanks for the feedback sam, will try to enable more value added features that make sense to traders! Is this feature is only for analysis softwares? can we configure trading/custom software along with Amibroker? Is this suitable for fully automation ? You can configure any trading terminal alongwith Amibroker. Yes it is suitable for fully automation as well. Thanks Rajandran. This is really great feature. Can we run our strategy 24hrs continuously? What is your experience ? to run 24x7 continously you need a little computing power 4GB-8GB ram and still in some cases trading terminal has to be restarted manually. So it is always recommended to do manual supervision on your system and ensure that everything is fine. And in very rare cases system takes a restart when there is any critical updates in Windows. What is the configuration of the cloud? How is the experience in the mobile Vs Tablet? By default one will get Windows 2012 Cloud Server, 1GB Ram. However price may vary if you need higher computing power. The user experience is currently good with Tablets and High end mobile devices with bigger screens. The same experience you cannot get with small mobile screens. 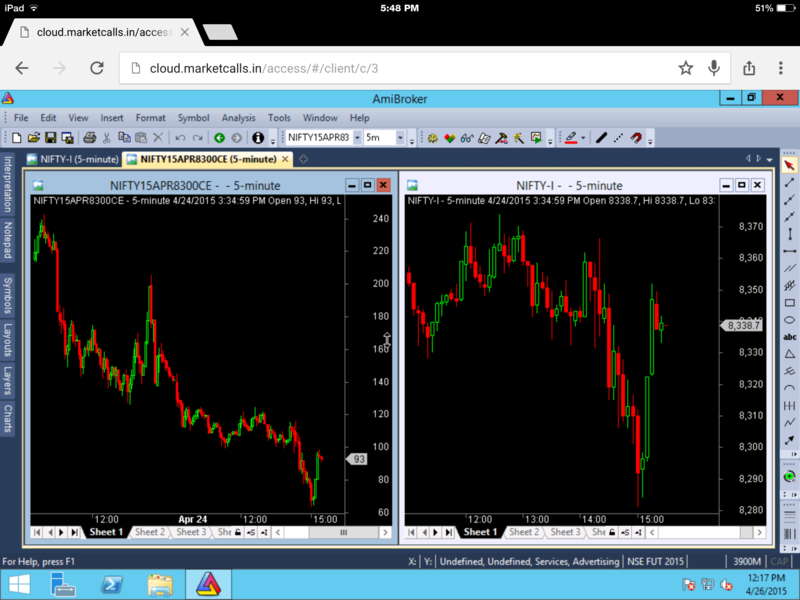 is this amibroker cloud can be accessed simultionsly form mullitple tab or laptop ? if logged in from one tablpet then it will disconet from other tableet? Logging in one browser will disconnect the other machine if tried to login with multiple machines. Can we add any afls’s in this setup? Yes you can come up with your own afl setups and you own the full control. Does the Amibroker cloud software need a separate amibroker licence or only globaldatafeeds cloud subscription. Also, can eSignal also be hosted. And you can access your machine elsewhere from the planet with any device connected to the internet. How much would it cost to have cloud + sharekhan’s trade tiger terminal setup for PA .
What could be the pricing for A good strategy for 75% intraday and rest can be positional or 100% intraday strategy for all all segment + nest with Algo(will arrange from my side) on cloud. Pls let me know the pricing or any better suggetion. I have Android above 4 and need to access automated trading in Meta Trader 4 with having trading account in Nest Trader 3. So is it possible to plug Nest with MT4 with Automated Trading. Also please let me know the per month and per year cost. You can Run MT4 and Nest Trader. However any algo trading solution to run in the cloud you have to arrange on your own. Yes you can install any software that supports Windows! How do you show your amibroker graphs on your website ? ?